CELEBRATED ANNUALLY throughout Thailand, the Loy Krathong Festival stems from the ancient tradition of floating handmade krathong, or decorated baskets, on a river on the night of full moon. The significance of Loy Krathong is to pay respects to Buddha and seek forgiveness from the goddess of water for any misdeeds against her. While celebrated throughout the country, Loy Krathong is especially mesmerizing in Chiang Mai, where thousands of floating lanterns fill the night sky producing a truly enthralling effect nowhere is there a better place to take part in this dazzling holiday than at The Dhara Dhevi Chiang Mai, a property enveloped in the timeless customs of Northern Thailand’s ancient Lanna Kingdom. “Enchanting Loy Krathong” offer is inclusive of three days, two nights’ package in the luxurious accommodation. Cost is 46,900 THB per villa and available exclusively from Nov. 13-16, 2016. The package includes: Two nights luxury accommodation in a Deluxe Villa; daily American buffet breakfast for two at Akaligo Restaurant; roundtrip transfer from/to Chiang Mai International Airport; Kad Mua, welcome drinks, followed by Thai buffet dinner at Le Grand Lanna for two persons on Nov. 14, including complimentary Kom Loy release and Krathong; private rice-planting experience; and complimentary resort scheduled activities such as morning alms giving, yoga, Thai boxing, etc. Advance reservation is required, and booking must be made directly with the hotel. From the left: Melissa Shaw, general manager at VIE Hotel Bangkok; Anakkawat Kowathanakul, vice-president consumer card Thailand of American Express (Thai) Co., Ltd.; and Nuntakorn Chang. 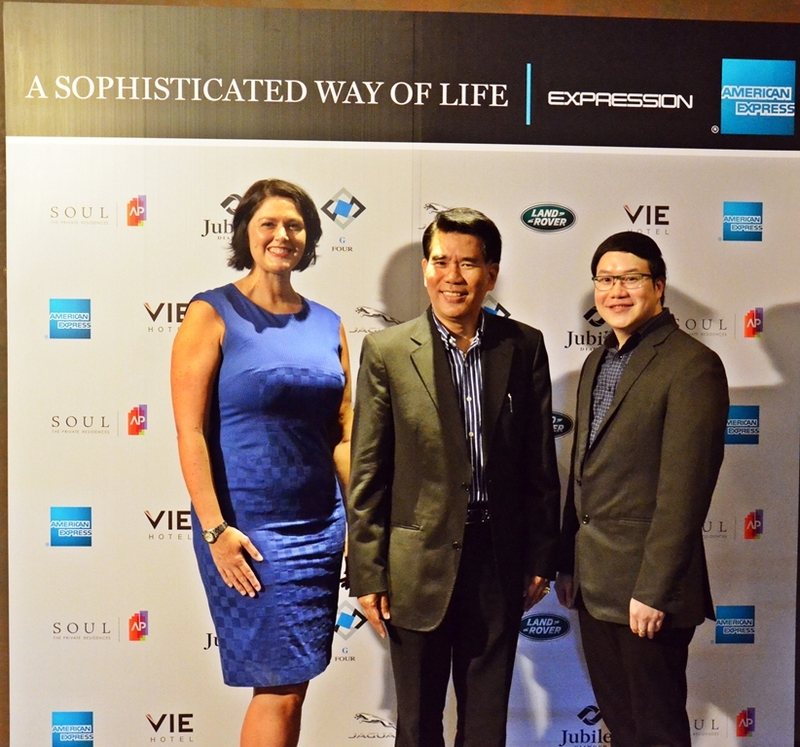 VIE HOTEL BANGKOK, a member of the MGallery Collection, was host the long-awaited re-launch of American Express’s Expression magazine, with a themed evening devoted to “A Sophisticated Way of Life”. The evening was attended by high-profile partners, and included a wine tasting organized by G Four Fine Wines; an exhibition from Soul, the private residence by AP Thai; Jaguar Land Rover’s latest vehicles with an exclusive one night only special offer; and a private showing of Jubiliee’s diamond jewelry, with experts on hand to provide insights, followed by a glamorous mini fashion show, featuring a selection of Jubilee’s latest collection. VIE Hotel Bangkok’s chefs prepared tapas and snacks paired with a selection of wines sponsored by G Four Fine Wines. Entertainment was provided by one of Thailand’s most famous fortune tellers.